Visited Sydney for a short break, and my friend who lives in Chatswood, recommended me to try Hakata-Maru. It was gooooood! A casual japanese restaurant, on ground floor of a corporate building close to Chatswood train station and opposite the RSL. I always love a restaurant where they provide you with a basket underneath your table for you to put your handbags and jackets. I always feel a little more friendliness from the service provided. We just had tap water because it was good to taste the ramen soup without any complexity. I had the Hakata-Maru Tonkotsu, their signature dish. It was creamy and beautiful with the black broth. The red paste on the spoon was chilli, so I skipped that, lucky it was easy to remove :). I’ve always had clear broths but if it’s good ramen, I’d try their creamy broth, just because I feel it’s very hard to make good creamy broth to my tastebuds. G had the Spicy Miso Tonkotsu. Broth lives to its name! But it’s definitely recommended for those spicy eaters. 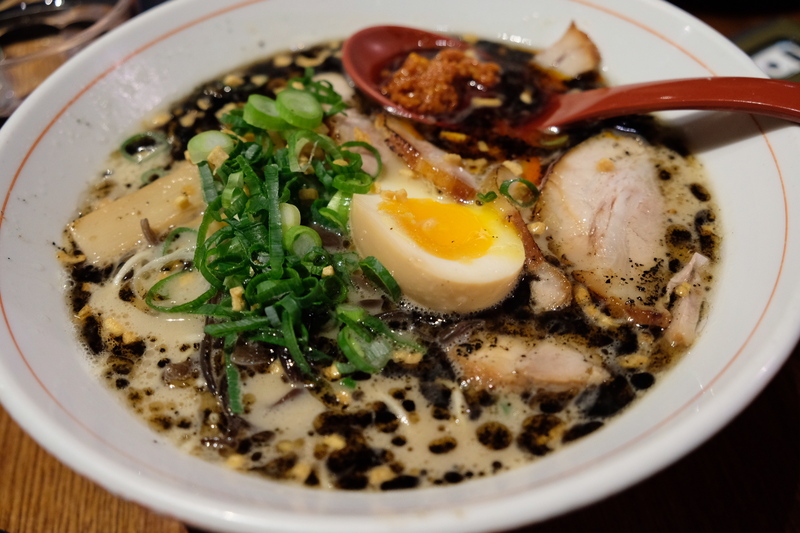 For non-spicy and you want more of a classic ramen, try the Miso Tonkotsu which is the next photo. Miso Tonkotsu is more of a clear broth and for first timers to try. Overall, it’s cheaper than Ippudo, but it is on par with Ippudo ramen. Size appears to be slightly bigger than Ippudo but the meat doesn’t melt in your mouth as much as my first experience of Ippudo’s ramen. In short – try it.